Incredible Connection is a technology specialist with a focus on bringing technological solutions to life. They offer the widest range of leading national and international brands – all supported by an in-store technical center that provides expert advice and assistance with installations, upgrades and repairs. Incredible Connection: All the solutions. All the service you need! If you don't have enough rewards points to pay for your purchase in full, you can use your Standard Bank Business Credit, Cheque or Debit Card to pay the difference. NOTE: You must activate your Business Rewards Card before you can redeem your rewards points at our Rewards Retailers. If you haven't yet activated your Business Rewards Card, you can do this online, or by calling the Business Rewards contact centre on 0860 UCOUNT (82 68 68). *IMPORTANT NOTE: The option to part-pay using your rewards points and a Credit or Cheque Card is not available for online purchases at Incredible Connection. 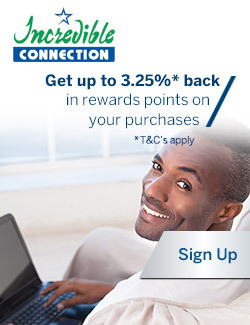 If you want to redeem your rewards points online at Incredible Connection, you will need to have enough points available to cover the total purchase. Your rewards points cannot be refunded back into your Business Rewards Card if you return goods that were purchased with your rewards points – you will be refunded with an Incredible Connection gift card or according to Incredible Connection's return policy. Rewards points can only be redeemed at South African Incredible Connection stores or online at Incredible Connection.